Amazing food day, and I barely even got out of bed, once I got myself into it. We flew into Paris at about 6 am and it was pitch dark. Still dark when our train got into the city about an hour later. 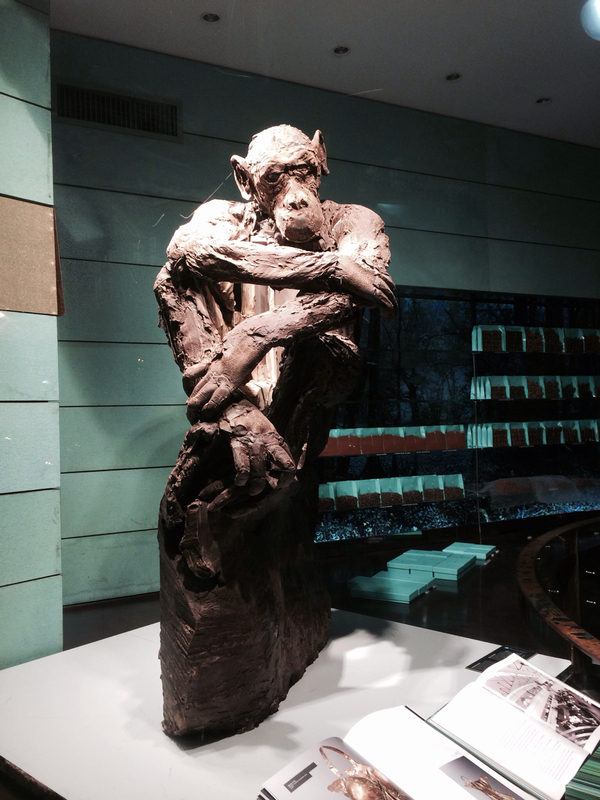 Walked to the Relais St. Germain from the St. Michel stop and passed a chocolate shop (Patrick Roger) with a life-size ape, carved out of an enormous block of chocolate. The photo isn’t great because it was so dark, but it was amazing. Anyway, our room was ready and, more importantly, since we’d paid for the previous night, breakfast was ours. 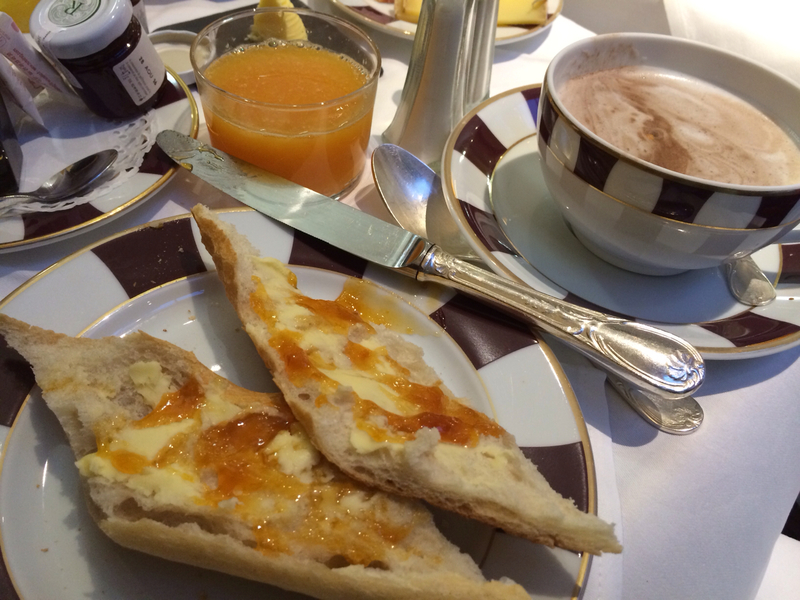 The Relais St.-Germain makes the best breakfast ever — simple, simple, simple, but everything is sourced carefully and beautifully. The best croissants (from Gerald Mulot), perfect baguette with creamy sweet butter and luscious jams, ham from Spain, French mountain cheese, rich yogurt and farm fresh eggs. Oh, and fresh squeezed orange juice, orange segments, spiced prunes poached in red wine, walnut bread, and probably something I am forgetting. Cafe au lait and chocolat chaud in huge morning cups. I am on such a weird cocktail of meds I couldn’t do it my usual justice, but I buttered crusty bread and slathered on tart sweet apricot jam. Heaven. 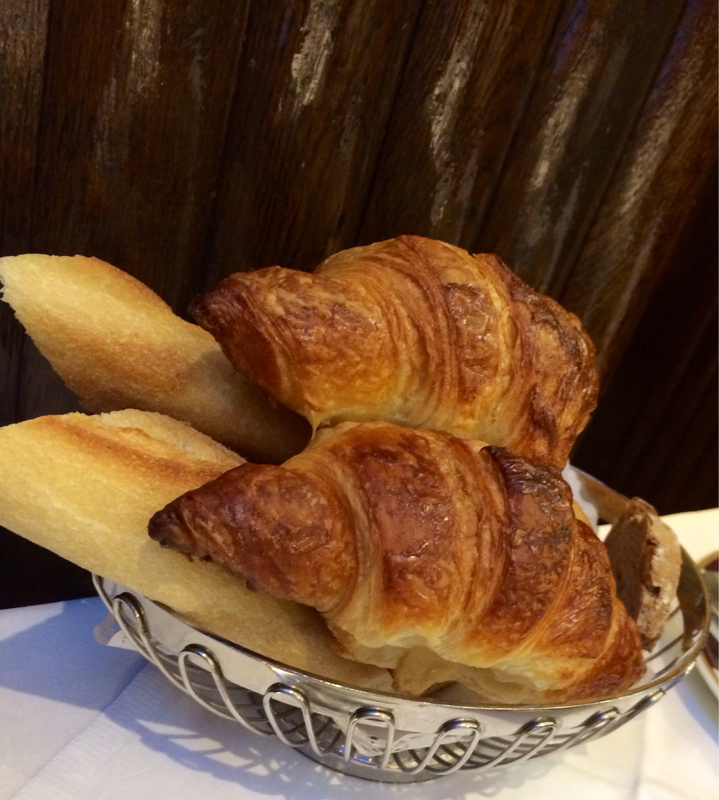 Followed up with an amazing croissant. Sipped from an enormous cup of rich, rich, rich hot chocolate. Stumbled upstairs and scrambled into my jammies for a nap that turned into an all day affair. Jer got up and took a long walk around the Jardin du Luxembourg. I kept sleeping. Probably smart given the bugs that have taken up residence in my system and the pain killers meant to dull their effect. I felt kind of bad sleeping through a whole day of Paris but this way I’ll have a fighting chance to be fit for the rest of the trip. So I slept some more. We had dinner reservations at Le Comptoir, downstairs, but I was far too queasy to make that happen so we switched them to tomorrow night. Instead, Jer went a few streets over to our favorite Italian place in the 6th (da Pietro) and brought back a couple of the best pizzas ever. Mine had eggplant, onions and mushrooms, and Jer’s was covered in Parma ham. Pretty spectacular. My only regret is that I couldn’t eat much of it. And then! Jer had stopped at Maison Larnicol, the koignette shop across the street on his first trip out and we split a couple of the sticky, decadent pastries — one just caramel, made with sweet salted butter, the other pistachio. 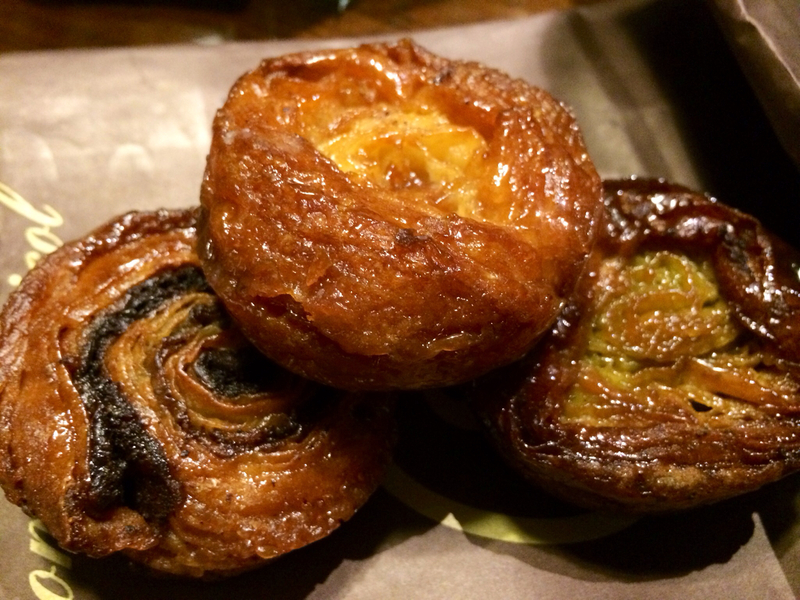 These little pastries are killer delicious, layer after gooey layer coiled into a sweet bundle of chewy syrupy goodness. There is nothing like them. I am falling asleep as I type this (all typos are due to that and the Percocet!). Going to cut out the pain meds tomorrow and hope for a more normal (but equally delectable) day. Bonne nuit! feel better soon, cuz! Paris awaits! I have to say..the ape is pretty darn cool! I can almost taste that sticky bun..